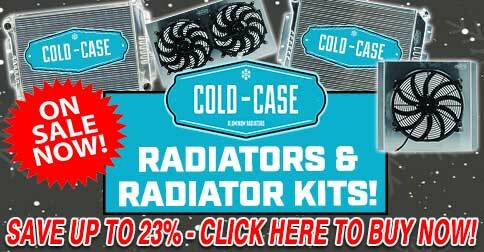 SAVE UP TO 23% OFF COLD CASE PRODUCTS! LIMITED TIME OFFER ACT NOW! Save Up To 23% off Cold Case Products! These COLD-CASE radiators are TIG welded 100% aluminum. These radiators have dual oversize cooling rows making them more efficient than 4 half rows seen on 4 row models. Cold Case aluminum radiators cool 20% better than OEM copper radiators and are more than 50% lighter. They are original in appearance with OEM style stamped tanks for strength and that OEM original look. Once painted, they look like originals to all but the concourse fanatic. Each radiator is pressure tested, direct fit and carries a Lifetime Warranty!